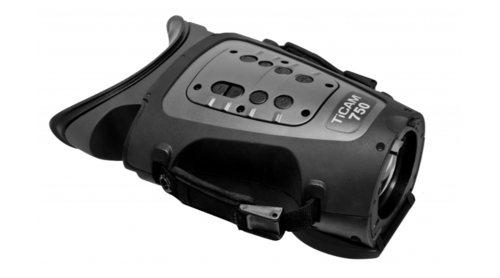 TiCAM 750 Thermal Imaging Binoculars – a medium-range Military Specification handheld thermal imager for military and civilian applications including special forces, search rescue, police, border security, target acquisition, counter drug operations, park rangers monitoring wildlife/illegal game hunters, VIP protection and for general situational awareness. TiCAM will detect a man at over 2 kilometers. Two models are available: TiCAM 750MR (Medium Range) is based on a Thermoteknix MicroCAM 384×288 25µ pitch detector. TiCAM 750LR (Long Range) features a higher resolution 640×480 detector with 17µ pitch.